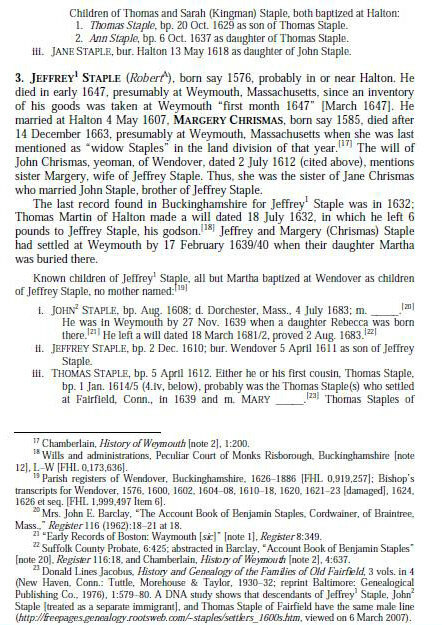 Jeffery STAPLES (1576 – 1647) was Alex’s 11th Great Grandfather; one of 4,096 in this generation of the Shaw line. He was also Alex’s 12th Great Grandfather; one of 8,192 in this generation of the Miller line. Jeffery Staples was born about 1576 in Halton, Buckinghamshire, England. 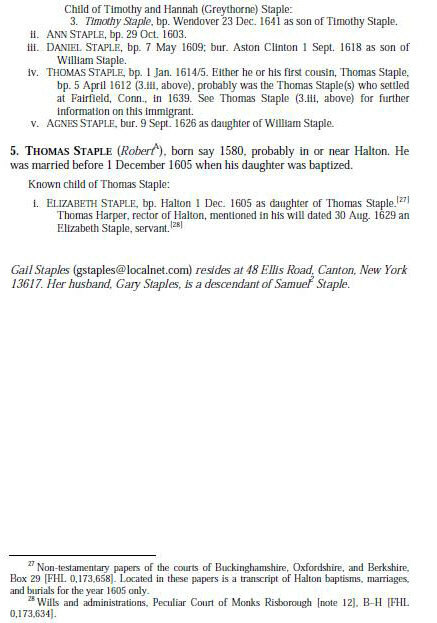 His father was Robert STAPLES (1550 – 1601). He married Margery CHRISMAS 4 May 1607 in Halton, Buckinghamshire, England. Jeffery died in Mar 1647 in Weymouth, Norfolk, Massachusetts. Margery Chrismas was born in 1585 in Halton, Buckinghamshire, England. 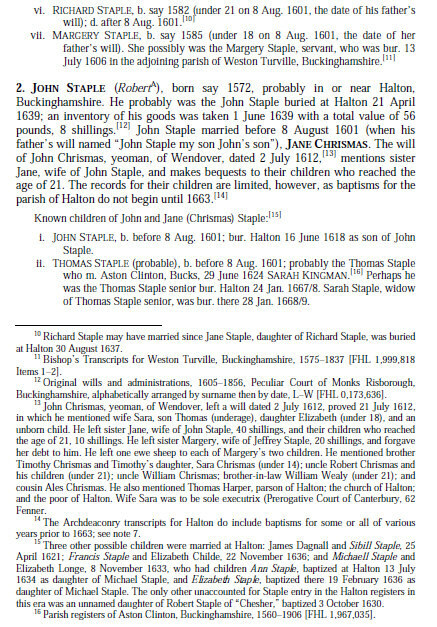 We know her maiden name because the will of John Chrismas, yeoman of Wendover dated 2 Jul 1612 mentions sister Margery, wife of Jeffery Staples. Margery died 14 Dec 1663 in Weymouth, Norfolk, Massachusetts. 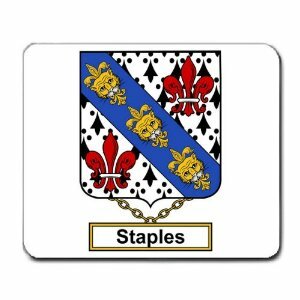 The Staples family name is of considerable antiquity in England. The name has been variously written Staple, Stapel, Stapelle and Stapul. A number of persons are mentioned of this surname among the nobility of England and the coats-of-arms they have borne are described in various works on heraldry. The Irish family carries on its coat-of-arms a representation of an iron staple, showing perhaps the supposed origin of the name and two English branches carry similar designs on their armor. 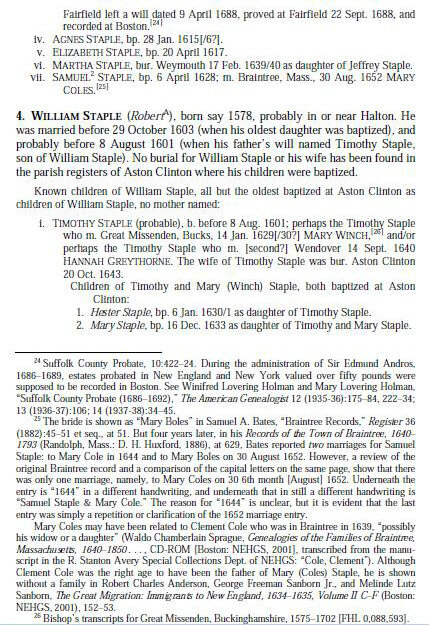 However, it is more likely that the surname of this family was taken from the trade, stapler, meaning wool dealer. 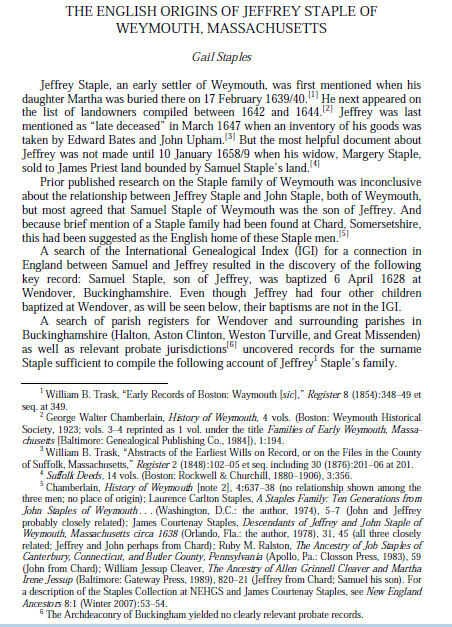 A NEHGR article on Jeffrey Staple of Weymouth, includes, as son of Jeffery, a John Staple, baptized Aug 1608, died in Dorchester, Mass., 4 July 1683, m. ____ at age 18, had dau. Rebecca born 27 Nov 1639 in Weymouth. 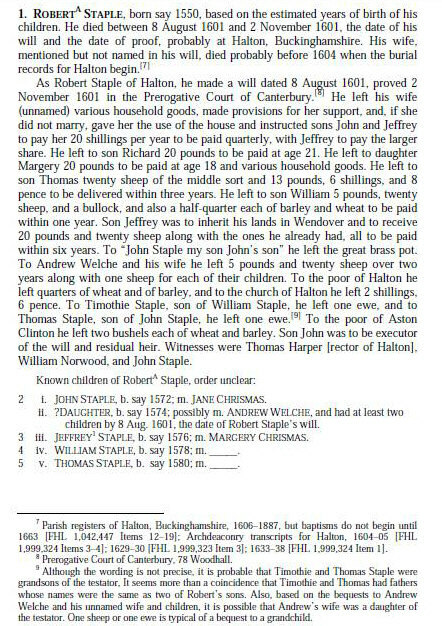 He left a will dated 18 Mar 1681/82 proved 2 Aug 1683. Thomas’ wife Mary Royce was born in 1603 in England. Her parents were Robert Royce (1562 – 1676) and Mary Hamlin (1562 – ). Mary died 12 Sep 1696 in Fairfield, Fairfield, Connecticut. In 1655 Thomas Staples sued Roger Ludlow in Fairfield, Conn. for accusing his wife of Witchcraft. Roger Ludlow (1590–1664) was one of the founders of the Colony of Connecticut. He matriculated at Balliol College, Oxford in 1609 or 1610, and was admitted to the Honourable Society of the Inner Temple in 1612. Ludlow sailed to America in May 1630 aboard the ship Mary & John with his wife Mary Cogan, a sister-in-law of Governor John Endicott of Massachusetts. They settled at Dorchester, Massachusetts, where they remained for five years. During that period he was chosen magistrate in the Court of Assistants for the Massachusetts Bay Colony. He was elected as Deputy Governor in 1634. 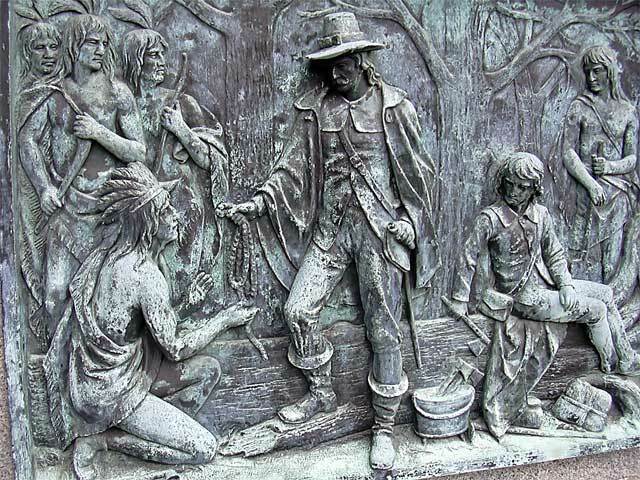 During this time Ludlow successfully negotiated the first treaty between the English and the Pequot. In 1635 he was defeated by John Haynes for Governor. In 1635 Roger Ludlow joined with other Puritans and Congregationalists who were dissatisfied with the rate of Anglican reforms, and sought to establish an ecclesiastical society subject to their own rules and regulations. The Massachusetts General Court granted them permission to settle the cities of Windsor, Wethersfield, and Hartford in the area now known as Connecticut. The Ludlows settled into Windsor. However, ownership of the lands for the new towns along the Connecticut River was called into dispute by the English holders of the Warwick Patent of 1631 that had been granted by Robert Rich, 2nd Earl of Warwick. The Massachusetts General Court established the March Commission to mediate the dispute between the Connecticut colony and the Saybrook Colony, and named Roger Ludlow as its head. 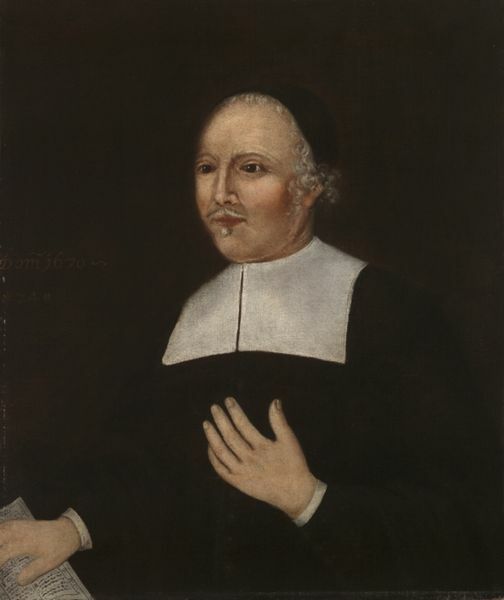 In early 1639 Ludlow’s political rival from Massachusetts John Haynes who had since settled in Connecticut was elected Governor of Connecticut. Ludlow then chose to take leave from Hartford and Windsor and obtained a charter from the General Court to begin a settlement at “Pequannocke” (present day Bridgeport). He left with a group of like minded settlers from Windsor, Watertown, and Concord to purchase property along the coast of Long Island Sound west of the New Haven Colony. While on this task Ludlow recalled the attraction of the salt marshes west of the Pequonnock River near “Unquowa” and purchased land there from the native Sachem and founded the town of Fairfield, Connecticut. Ludlow settled his family in the new town of Fairfield, but returned to Hartford in the fall of 1639. In a session of the General Court held October 10, 1639 Ludlow was censured and fined by the Court for having exceeded the terms of the charter granted to settle areas that were to have been east of Fairfield. Governor Haynes and Thomas Wells visited Fairfield to investigate the settlement and apparently found that it was acceptable. In 1646 Ludlow was asked by the Connecticut General Court to draft a comprehensive set of laws “grounded in precedent and authority and fitted to the necessities of the new civilization.” The result was “The Code of Laws of 1650”, or Ludlow Code, which is archived in the Connecticut Colonial Records. Having been tried for slandering Mrs. Thomas Staples of Fairfield (the accusation was that Ludlow had said that she was a witch) and lost as well as being appointed commander of a militia to defend Fairfield against invasion by the Dutch, Ludlow had grown weary of colonial life. He left Fairfield in April or May 1654. He first sailed to Virginia Colony to visit his brother George who had settled there. Then Ludlow left Virginia to return to England and made it to Ireland by September 1654. Ludlow settled at Dublin and in November 1654 was appointed to serve the Council as an adjudicator of matters relating to property law. The appointment may have been made at the request of Oliver Cromwell. He served on the commission from 1654 to 1658. Ludlow died in Dublin about 1664. Roger Knapp was born about 1618 in England and came to New England in the early 1640s. He eventually settled in Fairfield in the colony of New Haven in 1644 (now Connecticut). Not much is known about Roger Knapp except that he is listed as a farmer and an Indian trader. In 1653 his wife, known only as “Goodwife” Knapp, was accused and convicted of witchcraft and executed by hanging in Try’s field outside the village of Fairfield. Nothing is known of the trial of Goodwife Knapp or what she was accused of. The remarkable thing about the Goodwife Knapp execution is not the trial itself but the aftermath. Roger Ludlow, the Deputy Governor of Connecticut, had been fighting on and off for several years with his neighbor Mary Staples (wife of Thomas Staples, also known as Staplies). In 1651 Ludlow won a suit against Mary Staples for slander but this did not put and end to their dispute. During the trial and imprisonment of Goodwife Knapp, Roger Ludlow and his supporters tried to get her to affirm that Mary Staples was a witch but Knapp refused. Just before the execution, Ludlow claimed that Goodwife Knapp came down the ladder and whispered in his ear that Mary Staples was, indeed, a witch. Ludlow told this story to his friends, Rev. John Davenport and his wife, and it soon spread to the entire village of Fairfield. Accusing someone of witchcraft was a very serious charge—especially just after Goodwife Knapp had been hanged. When Thomas Staples heard that Ludlow was making these accusations against his wife he filed a defamation suit against Roger Ludlow. Mary Staples had the support of Rev. John Davenport, the leading minister of the New Haven Colony who testified on her behalf. The magistrates decided in favor of her husband’s suite and find Roger Ludlow £15. Yet a reputation for witchcraft lingered about Mrs. Staples for in 1692 she was indicted for the crime along with a daughter and granddaughter. Those cases ended in acquittal. The trial took place in May, 1654. There are several on-line accounts from books that have recently been scanned. The best and most readable is from The Witchcraft Delusion in Colonial Connecticut by John M. Taylor. This is from the trial records and some of the descriptions are quite graphic, particularly the account of Goodwife Staples’ examination of Goodwife Knapp’s body for witch’s teates. “May the thirteenth, 1654.”Hester Ward, wife of Andrew Ward, being sworne deposeth, that aboute a day after that goodwife Knapp was condemned for a witch, she goeing to ye prison house where the said Knapp was kept, she, ye said Knapp, voluntarily, wthout any occasion giuen her, said that goodwife Staplyes told her, the said Knapp, that an Indian brought vnto her, the said Staplyes, two litle things brighter then the light of the day, and told the said goodwife Staplyes they were Indian gods, as the Indian called ym; and the Indian wthall told her, the said Staplyes, if she would keepe them, she would be so big rich, all one god, and that the said Staplyes told the said Knapp, she gaue them again to the said Indian, but she could not tell whether she did so or no. teates, I, sayes the said Staplies, haue such myselfe, and so haue you if you search yorselfe; goodwife Lockwood replyed, if I had such, she would be hanged; would you, sayes Staplies, yes, saith Lockwood, and deserve it; and the said Staplies handeled the said teates very much, and pulled them wth her fingers, and then goodwife Odill came neere, and she, the said Staplies, still questioning, the said Odill told her no honest woman had such, and then all the women rebuking her and said they were witches teates, and the said Staplies yeilded it. [some spelling corrected for readability] “John Tash aged about sixty four or thereabouts saith he being at Master Laueridges at Newtown on Long Island about thirty year since Goodman Owen and Goody Owin desired me to goe with Thomas Staples wife of Fairfield to Jemeaco on Long Island to the house of George Woolsy and as we were going along we came to a durty slow and thar the horse blundered in the slow and I mistrusted that she the said Goody Staples was off the horse and I was troubled in my mind very much soe as I came back I thought I would take better notice how it was and when I cam to the slow abovesaid I put on the horse prity sharp and then I put my hand behind me and felt for her and she was not upon the horse and as soon as we were out of the slow she was on the horse behind me both going and coming and when I came home I told these words to Master Leveredge that she was a light woman as I judged and I am ready to give oath to this when legally called tharunto as witness my hand. MARY STAPLIES. Fairfield, 1692. Jury found no bill. Samuel’s wife Mary Coles was born about 1631 in Dedham, Norfolk, England. Alternatively, her maiden name was Bowle or Bowles. Mary died in 1669. This entry was posted in 13th Generation, 14th Generation, Immigrant - England, Line - Miller, Line - Shaw, Storied, Witch Trials and tagged Roger Ludlow's witchcraft accusation, Weymouth Pioneer. Bookmark the permalink. See http://www.usgennet.org/family/bliss/rehoboth/rehoboth.htm (bottom of page) for explanation of “Widow Ide” who married Thomas Bliss in England.